Subnational actors are on the frontlines of managing the response to climate change, as they balance both the short-term imperative to protect residents and manage climate-related disasters, as well as the long-term challenges to make cities more low-carbon, resilient and inclusive. Cities and regions are major investors in the infrastructure that will be the foundation of a low-carbon, inclusive future, accounting for almost 60% of public investment in OECD countries. They will also manage the impacts of such investments over the longer term — either benefitting from investments in more resilient infrastructure, or paying the economic, environmental and human price for those that are not climate-proofed. Indeed, climate change damages are poised to have a disproportionate impact on populations that are already vulnerable: for instance, low-income households often have increased exposure to climate risks and hazards and a higher susceptibility to damages from climate change; they also have a lower capacity to recover from damages, as they often lack access to insurance systems and safety nets. With this context in mind, many local policies for climate change and environmental sustainability are applying explicit equity and social inclusion lenses. How are cities approaching this dual challenge? What dimensions of inclusion are prioritised in cities’ plans? In what areas and policy sectors have cities identified opportunities for win-wins between climate and inclusion objectives, as well as trade-offs that must be mitigated? How are cities measuring outcomes? 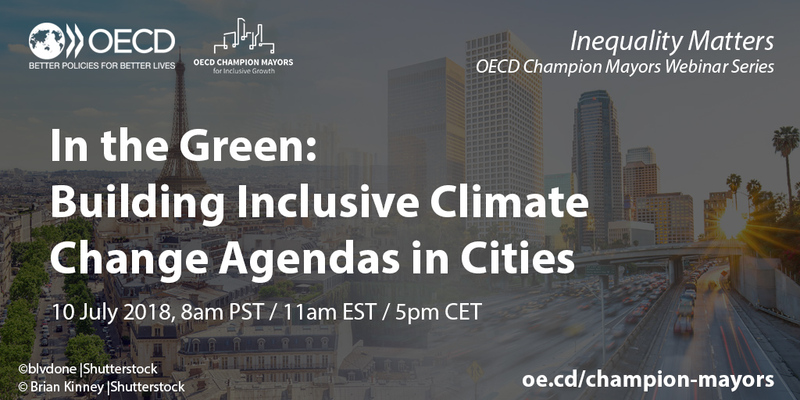 This webinar was supported by findings from recent OECD work, including the Seoul Implementation Agenda for Inclusive Growth in Cities, launched by the global coalition of OECD Champion Mayors in October 2017, which recognises the need to incorporate an inclusive growth lens into climate change-related activities and investments. It was organised as part of the OECD Champion Mayors for Inclusive Growth Initiative and contributes to the joint OECD-World Bank-UNEP project, Financing Climate Futures: Rethinking Infrastructure.